This may not be new for many of you, but I just added a link to my list of resources on the right and wanted to highlight it. D. L. Ashliman's collected folklore and fairy tale texts are available here. When researching folk texts I often find that by googling the title of a folk tale it will bring me to this resource, but having gone the back door way so many times, I didn't even realize until reader Nectar Vam sent me the link that there's a page that has all the folktales, sorted out by categories! This is super helpful for looking up variants of a tale online. 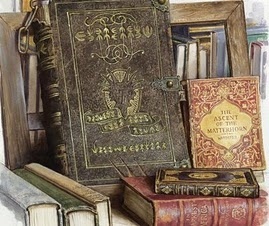 You can read versions of standard fairy tales like Cinderella or Beauty and the Beast from all over the world, as well as fables and legends. There are humorous categories like Clothes Make the Man (which doesn't actually contain "Emperor's New Clothes," that's a whole separate category), or creepy ones like Haunted by the Ghost of a Murdered Child. There's so much to explore, it's a great free resource! Thanks, Kristin, it all looks great! I'm off to check it out. Ashliman is the king of online fairy tale sourcing. His site is clunky, kind of ugly and utterly indispensable. Thanks for helping to spread the word on his great site! His site has been one of the resources I've been using for years! He did a good job at categorizing the tales, and I was introduced to many variants because of his site!